The final result of a game tends to cloud the overall judgement of a performance. Where the Stoke game could easily have been 1-1 but finished 2-0, everything looks rosy; however on Saturday, although Norwich deserved their win, the Swans performance was let down by a number of sloppy defensive errors rather than being outclassed. 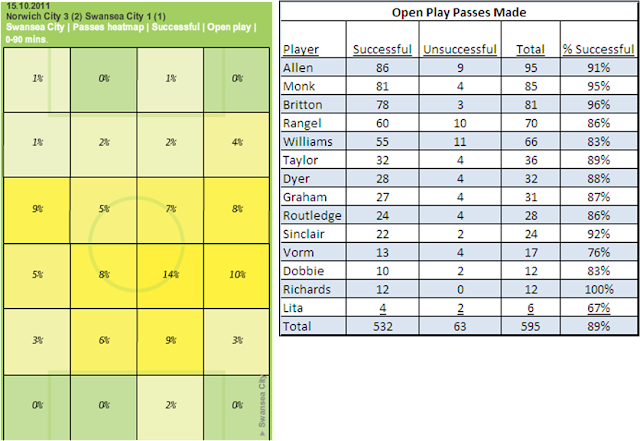 It's unusual for Monk to have so much more of the ball than Williams, but it's possible that Williams' desire to push forward with the ball on a number of occasions meant a reduction in the number of slow-tempo 1-2s that usually occur between Williams and the midfield. It was also noticeable the amount of time Danny Graham came back deep for the ball as can be seen below when comparing Graham's activity with that of Morison for Norwich (both of whom had very good games). Whilst it is good to see a forward looking for the ball here it was a case of not being in areas where he could do any damage and overall Graham had only 2 shots, one of which was the goal. 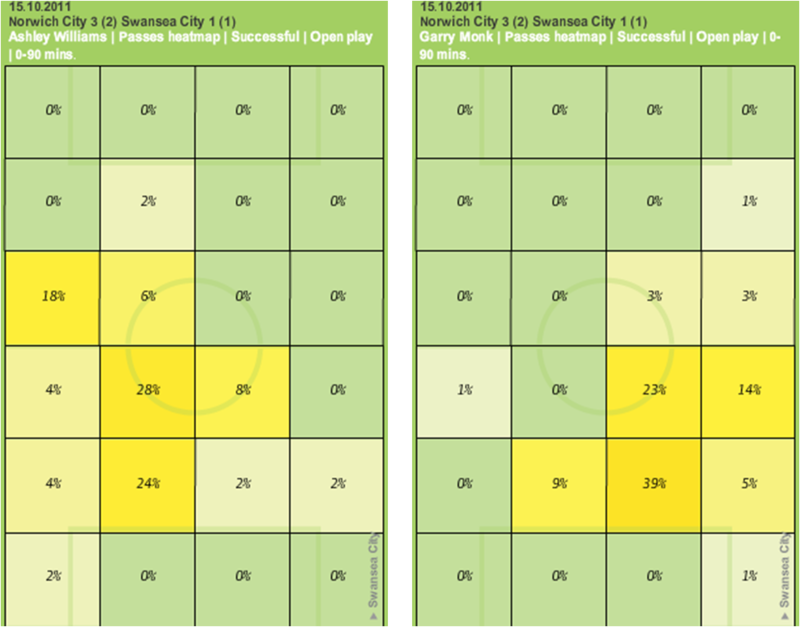 As mentioned in last weeks preview, over the 4 games prior to Saturday, Norwich we averaging over 50% more attempts on goal a game (15.5) compared to Swansea (10). This differential was again in place on Saturday with Norwich having 18 attempts to Swansea's 12. 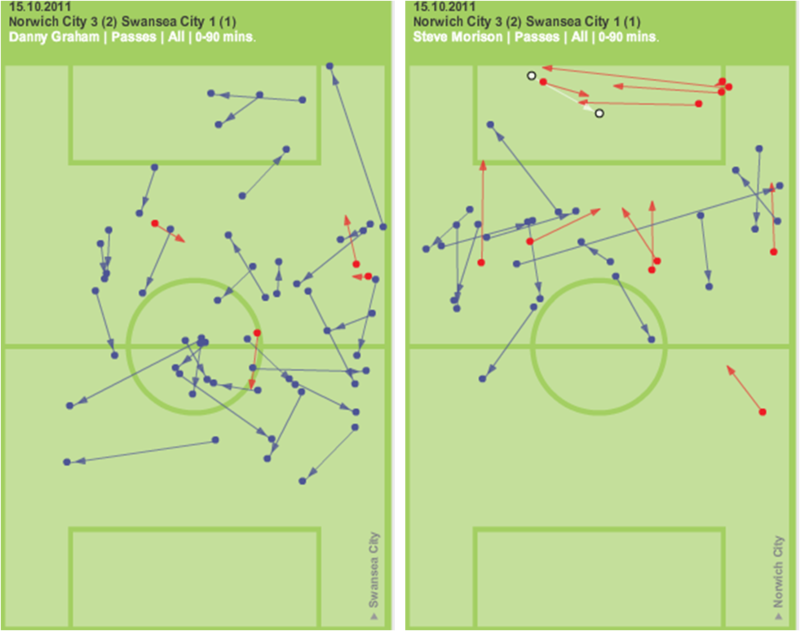 Dobbie (along with Sinclair) had the highest number of attempts with 3 despite only playing 30 minutes, although two of these efforts came within seconds of each other and were fairly tame affairs. The attacking midfielder/second striker role is still up for grabs with the rest of the team (based on those currently fit) largely picking itself. Routledge looked sharp and direct in the first half but quiet in the 15 minutes he had in the second half, Dobbie when he came on appeared to me to be trying too hard as he knew it may be a few weeks before he gets a decent chance again. For me the best option is to play Allen in this position and to bring in Gower (or Agustien when fit). The next two games, Wolves away and Bolton home will bring us up to 10 Premier League games played and give us a real idea of where we stand, what I've seen so far suggests there's no reason why we can't stay up but it's going to be a long hard road. Ultimately it may as much rest on the failings of others (Wigan/Sunderland I'm looking at you especially) as much as our own efforts.